I added another design to my portfolio yesterday, and I'd love to offer it as a 5"x7" print. 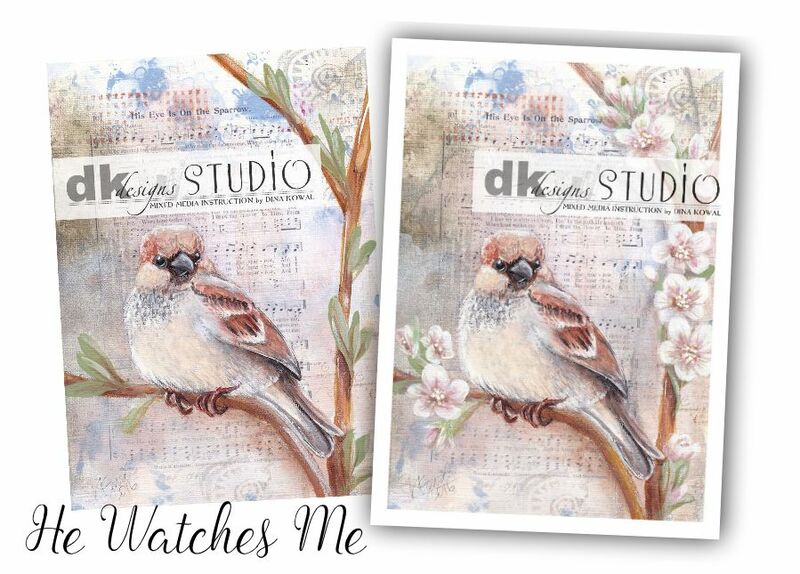 This sweet little sparrow was inspired by a favorite hymn that says, "His eye is on the sparrow and I know He watches me..." and I incorporated that hymn into the background. It was a particularly needed encouragement that popped into my head yesterday when I was feeling especially stressed, and it overflowed into this little scene. I would love to share my little sparrow with you if you need this reminder as well - prints will be available for preorder through March 12th, and I will place an order at the end of that day. The piece will be printed on gorgeous textured paper and packaged for gift giving, in case you'd like to send it to a friend who needs some encouragement. There are 2 versions of the painting - one with flowers and one without. Thanks so much! Also - I'd love to do more of these nature prints with hymns in the background - if you have an idea or a favorite hymn you'd like to see done, please leave me a comment! Oh, Dina, these are gorgeous, and I just ordered them and more of some of the others. What wonderful gifts! Thank you for sharing your artistry with us and your faith journey. I would love to see you do for "Amazing Grace." Hugs! Another gorgeous print Dina! How about "On Eagles Wings" for another hymn? Thanks!